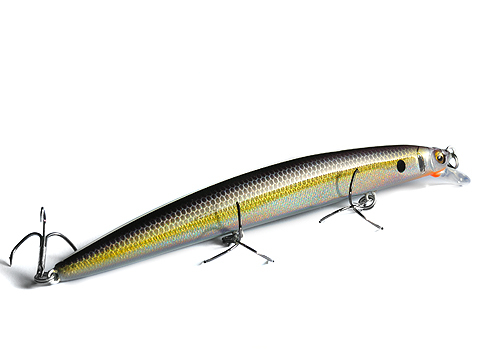 The world challenge plug X-140 is a new dimension high response minnow overturning the common sense of big minnows that became sluggish due to the increase in water resistance. Please check out the true value of the “craft minnow” which Megabass has put in the long year minnow building method. At straight retrieve, the “high pitch rolling action” stimulating the tough neutral fish will realistically flash and appeal. X-140’s extremely delicate and natural behavior, which Megabass has thoroughly pursued, is the “extreme action” the monster hunters have been demanding for many years. X-140’s true value is its instantaneous unique dart action shown when it hits the turning point of the currents. Megabass original “hydro body” with a twist form will work together with the moving balancer, instantly sliding by striking “rolling & dart”. It will trigger feeding in different dimension, aggressively capturing monster fish migrating in lower range than the lure. The “ low altitude- ultra long cast ability”, which surprised the testers of X-140, is brought by the super high-density tungsten balancer and the aero body calculated for rectifying effect. It will challenge the monster from further distance than the past minnow, pulling out the cruising fish from even wider areas.